Like a sculptor in an earthquake, a professional pet groomer is a balancer of aesthetic obsession, practicality, athleticism, efficiency, patience, and perseverance. Somewhere between passion and objectivity there stands a perfectly groomed companion animal. And an exhausted groomer. Cuz he sure wasn't standing like that the whole time. How do you report 47 tragedies without mentioning the roughly 2 billion safe grooming shop visits happening in the same time frame? We can't dismiss these individual dogs or what happened to them, but they are outliers, not the norm. Statistically, the car ride to the grooming shop is more dangerous for your pet than anything that might happen during a nail trim or a bath or a haircut. Here are some numbers to help put this in perspective (disclaimer: I'm not a statistician, so feel free to check the math, but even if the numbers aren't perfect, they provide a clearer picture of the actual threat involved in dropping your pets off for grooming). Also, because there have been incidents at private shops as well, it's worth looking at the grooming industry as a whole, rather than singling out corporate locations. It's challenging to pinpoint exactly how many professional pet groomers are currently working in the US, but the Bureau of Labor Statistics reports that in 2016, there were 296,400 jobs available in the "Animal Care and Service Workers" category. That includes trainers, veterinary assistants, kennel workers, and more, so pet groomers make up a sub-set of that number. According to Petgroomer.com's annual industry survey, 41,271 businesses advertised grooming services in 2017. Many of those businesses will have multiple groomers employed and other businesses may not be advertising at all, so it's not unreasonable to estimate that there are somewhere around 200,000 professional pet groomers currently working in the US. Average workload varies, but if we simplify and say that they're all grooming 5 dogs per day, 240 days per year, that's 240,000,000 grooms happening in this country in one year. The NJ.com investigation tallies 47 deaths over a 10 year period, but it's impossible to know exactly how many more there may be when you factor in private salons and unreported incidents. For the sake of argument, let's put the number at 500, which seems shockingly high until you factor in the total number of grooms happening. 500 out of 2.4 billion puts the odds of a pet dying in connection with a grooming service over a 10 year period at 1 in 4.8 million. In comparison, the odds that you'll be struck by lightning in your lifetime is 1 in 3,000. From here, you could make the argument that taking your dog to the groomer once every month for 10 years increases his odds to 1 in 40,000, but that's not really how it works. Almost all grooming shop deaths (which happen so rarely that almost none of us will ever be involved in one in our 40+ year careers) are related to pre-existing conditions in dogs exacerbated by stress. Dogs who are groomed regularly are safer in a shop because these dogs tend to be calm and cooperative. If they've been going to the same place for a while, their groomer will know them well enough to identify signs of distress. Most groomers understand risk factors in grooming very well (ie: stress is more dangerous for breeds with flat faces, for animals who are overweight, for senior pets, and for pets with certain medical conditions) and will either adjust their process to minimize stress or will refuse to groom an animal outright. What is common in the industry, are situations where the pet groomer plays the hero -- noticing something off and sending a dog and its owner to the vet, who then diagnoses a serious illness like a heart condition or diabetes or a cancerous tumor. Going to the groomer regularly is much more likely to save your pet's life than to destroy it. And if nothing so dramatic happens, it's important to consider that the odds that an average pet will suffer from a lack of grooming is very high. Chronically overgrown toenails can cause arthritis, undiagnosed ear and skin infections make pets miserable, and unchecked matting can get so tight that it cuts off circulation to the skin. The list goes on, and this is what groomers work to repair or prevent both in their shops and through education every single day. 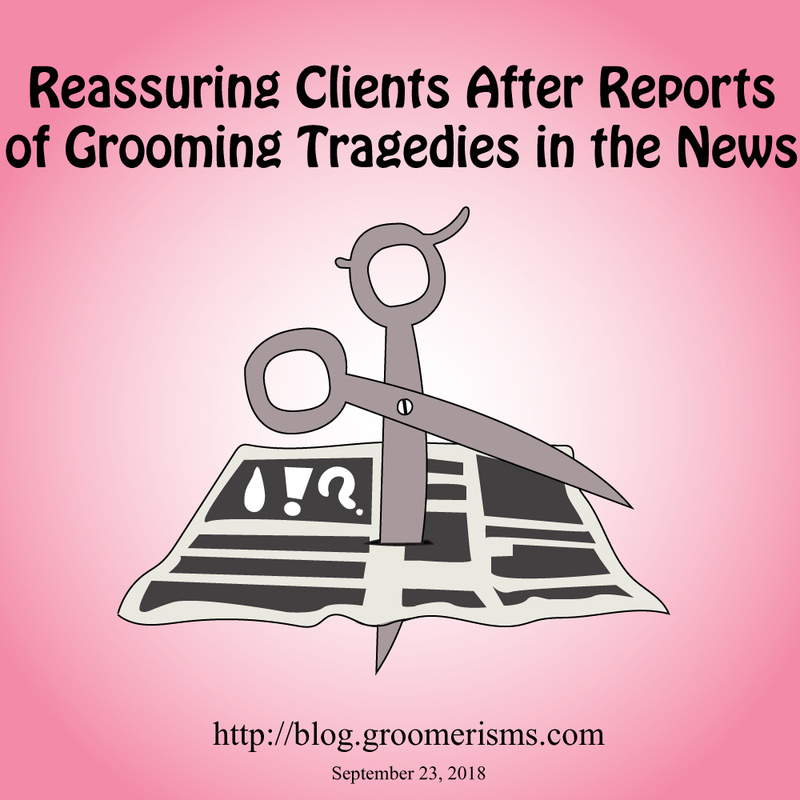 Everyone in the grooming industry is concerned about what happened to the individual dogs in question and we all follow these stories very closely. We support standards of safety and advanced handling training for anyone who works with animals. There's a lot of talk about regulating the industry and there have been many attempts to pass laws named after animal victims of grooming shop tragedies. Unfortunately, arbitrary rules applied to grooming doesn't seem to be the answer to keep pets safer. After all, Petsmart has one of the most extensive lists of employee do's and don'ts in the industry. What keeps pets safe are well-informed groomers in supportive settings who are empowered to use good judgement. As a pet parent, it's important to seek out a grooming establishment that you feel you can trust. And while there are some irresponsible, poorly trained, overstressed, unkind and/or simply unlucky groomers out there, the majority of us are well-informed, safety-conscious, conscientious, and completely obsessed with the health and happiness of our client pets. Groomers: please feel free to share this post wherever you feel is appropriate. And remember to talk to your clients from the heart when they come to you with concerns. It's not your job to defend or defile other groomers or other businesses. It's important to act as a representative of the industry as a whole. Be honest and transparent, but resist the urge to gossip or take sides against competitors. When you're talking to clients, remember to have compassion for everyone involved in an accidental pet injury or death. When clients or potential clients mention the latest news horror stories, your job in that moment is to make them feel comfortable leaving their pet with you (even if they've been coming to you for a decade and you're feeling a little hurt because you think they should know better). 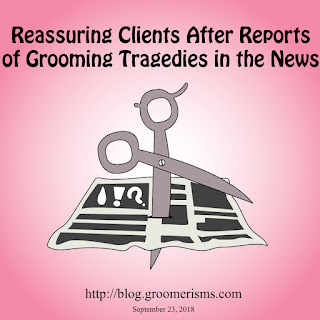 It's not helpful to criticize or speculate about how age or size or other characteristics of the animal or about any unrealistic expectations or neglectful behavior on the part of the owner or how overworked, under-trained employees or various equipment or techniques may have contributed to a grooming shop tragedy. You can certainly and should talk about those things in other forums, especially in the context of evaluating the safety of grooming for individual pets. Facebook groups, industry websites, grooming magazines, workshops, and tradeshows are all there for you to participate in the discussion and continue to develop the varied and specialized skills that make pet grooming such a remarkable trade. Be thoughtful, be kind. Happy grooming. © 2015 Groomerisms.com. Simple theme. Powered by Blogger.